Based in Red Bank, NJ, Sweetwater Capital Group is a private equity investment firm formed in 2002. We invest primarily in service businesses with recurring revenue streams protected by inherent barriers to entry. 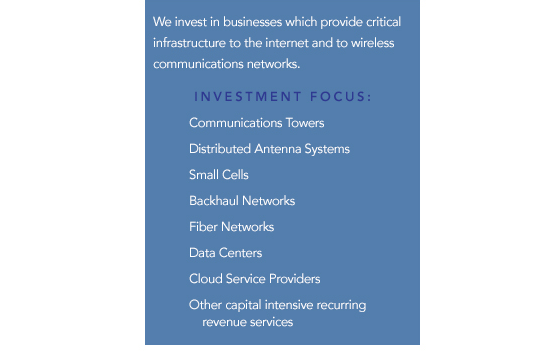 In particular, we focus on those businesses which provide critical infrastructure to the internet and to wireless communications networks. We bring decades of experience as successful owner/operators and investors. We believe that our experience and knowledge base allow us to achieve superior returns on our invested capital, and also provides an opportunity for wealth creation for the management teams we support. We bring more than just cash to the table: we help management teams of young companies successfully address the challenges of rapid growth. We are flexible with regard to investment structure and can invest in both control and minority positions in our portfolio companies. A key component of every deal for us is to back a talented and highly motivated management team, and to make sure that our interests are fully aligned with those of management.